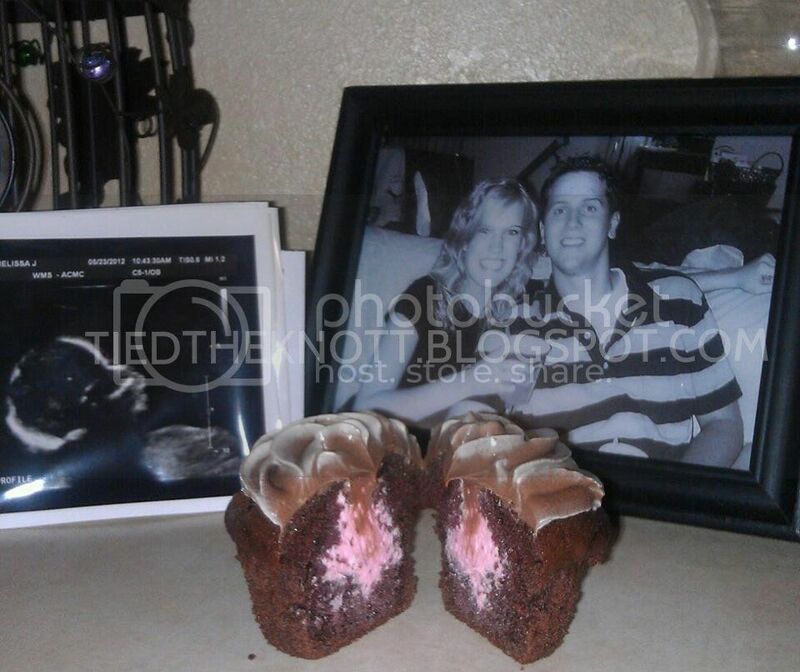 After We Tied The Knott...: Blog GENDER REVEAL! The moment you find out if Baby K will be a he or a she. But first, to keep you on the edge of your seats, our reaction. I know, the anticipation was killing me, too. We got our cupcakes Saturday morning after 2 full hours of crazy Melissa cleaning. I didn't need them though. I already knew what we were having. When we got home, we all showered and got ready for the day (Becca (who stayed the night before), Tyler, and I). People started coming over at about 2. By 4 we were eating with every single person we invited. 5:30 was the big moment. Cupcakes were passed out and everyone was told to wait until Tyler and I looked at ours. I looked at Tyler, tears in my eyes and said "I WAS WROOOOOONG!"! Tyler broke his open and looked at me with his mouth wide open. Oh. My. Lanta. Yes, we are having a baby GIRL in October. 48% of you were right (I, was not. I was 100% sure we were having a boy). I might have to have them double check on Wednesday at the next ultrasound. Prove it! Time to start stocking up on ribbons and bows! Holy Hannah, a baby girl. My first thought when I saw it was: Tyler told me exactly one week before that he wanted a girl. I am going to go bask in the girly details that will soon be in my daughter's room. AGH! My DAUGHTER! And the ultrasound says... ________________!!!!! Congratulations! That's sooo exciting. :) Oh and that cupcake cooks delicious by the way! Love the picture you took of it! congrats love! a daughter is just truly amazing!